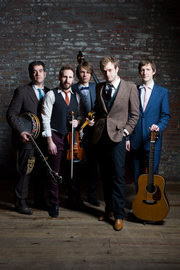 The Punch Brothers (USA) are scheduled to make a week-long tour in western Europe in the latter half of January 2012, supporting Amos Lee. Details for three shows in Britain have been published on UKBluegrass.com. Two shows (16 and 17 January 2012) in the Paradiso, Amsterdam (NL), are already sold out. A show in La Cigale, Paris (F), is scheduled for 19 January. Location maps and online ticket-purchase links can be found on the band's tour schedule page.